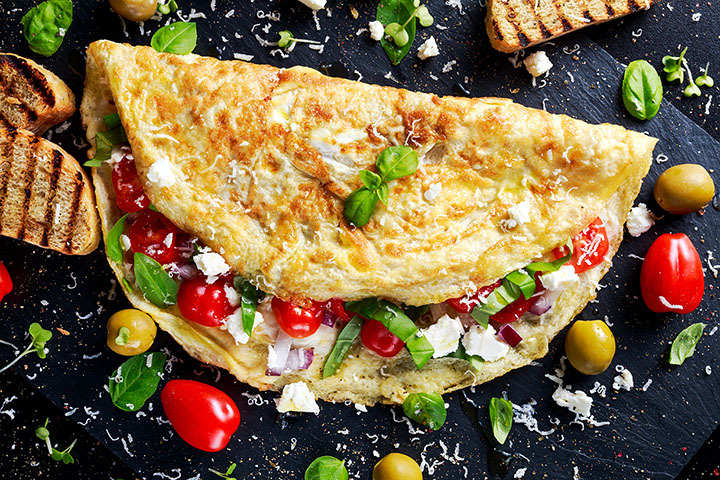 Craving a scrumptious, hearty omelet? You’ve come to the right place. Maryland takes breakfast seriously, so when it comes to crafting up the perfect omelet, they never go wrong. Whether you’re looking for an all-veggie style delight or a hefty meat-filled concoction, you’ll find it at Maryland’s great cafes and restaurants. Here are the 10 best places to grab an omelet in the state. Miss Shirley’s Café has three locations, two in Baltimore and one in Annapolis, Maryland. They’ve been featured by Zagat and TripAdvisor as the “Best Restaurant” and “Best of Annapolis,” and it’s easy to see why. Between the wide selection of breakfast, lunch, and brunch items, and the fun, care-free attitude, Miss Shirley has herself a winner. Their three-egg omelets come with your choice of shredded potato and onion hash browns, collard greens, mix greens, broccoli salad, coleslaw, succotash, and much more. We recommend the South of the Border Omelet, made with grilled chicken, red and yellow pepper, jalapenos, white cheddar cheese, pico de gallo, avocado mash, and a dollop of sour cream. Volt Family Meal in Frederick, Maryland, rose to prominence in part due to its owner and head chef’s celebrity status: Bryan Voltaggio, runner-up “Top Chef,” is the owner. But Volt doesn’t rest on its laurels. Their breakfast menu includes an incredible omelet, prepared with caramelized onion, goat cheese, and served with home fries. There aren’t a ton of omelet options at Volt, but when the eating’s this good, you don’t need them. Blue Moon Café in Baltimore, Maryland, is open daily from 7 a.m.-3 p.m., and around the clock on weekends. The owner has infused her personality into the café, from the “bright and funky artwork to the music.” The café is an old-fashioned, American diner, with large portions and delicious breakfast food, including their three-egg “Heavenly Omelets.” Each omelet is served with hash browns and toast or a biscuit. If you can only choose one of their nine omelets to try, go with the Universal. Inside you’ll find diced ham, sausage, bacon, broccoli, mushrooms, onions, peppers, tomatoes, mozzarella, and cheddar cheese. It’s a work of art. Trust us. Eggcellence in Annapolis, Maryland, styles itself as “A Breakfast Brunchery,” meaning it specializes in breakfast and brunch (although they offer lunch options, too). Each of their omelets are served with breakfast potatoes and your choice of toast or an English muffin. While you could build your own omelet out of 20-some-odd options, we recommend trying out their Marylander first. Crab meat, avocado, and fresh tomato with Swiss cheese? Can’t go wrong with that. The Breakfast Shoppe in Severna Park, Maryland, serves up breakfast and lunch every day of the week, as well as offering catering options. Make sure to check out the chef’s daily specials, as you might find a brand new omelet offering. If you aren’t so lucky as to catch a special, fret not: their Select Shoppe Pan Omelets, served with home-fried breakfast potatoes and a choice of biscuit, croissant, or cornbread, are worth the trip alone. Try the Chili Omelet, overflowing with their slow cooked, house made chili, cheddar cheese, green onions, sour cream, and fried tortilla chips. The Louisiana Kitchen and Bayou Bar in Bethesda, Maryland, offers tantalizing creole flavors in their omelets. If you’re in the mood to try something unique, give the omelet entouffee or creole a go. Choose between adding chicken, Andouille sausage, shrimp, or crawfish to give it that extra Louisiana finish. First Watch: The Daytime Café is a growing chain of restaurants that is slowly but surely spreading throughout the country. But don’t hold that against it: the food, inspired by healthy options and made fresh, is clearly why they’ve had so much success. With five Maryland locations, you’re never too far away from a First Watch. Locations include Bowie, Laurel, Pikesville, Timonium, and Rockville. If you’re lucky enough to catch their seasonal menu, then try the crab and asparagus omelet, made with fresh crab, asparagus, tomatoes, Monterey jack cheese, tarragon, and chives. Alexanders Restaurant in Buckeystown, Maryland, was listed as one of the top 10 brunch spots in the area by Gayot. Gayot describes Alexander’s as “American fare in a quaint, tranquil country setting” situated in a restored 1780s house. The food, prepared by Chef Chris Smallwood, has an evident southern flair. The Buckey’s Omelet, stuffed with Wagner’s ham, bronzed onions, aged cheddar, mushrooms, and roasted peppers, is reasonably priced and decadently delicious. La Ferme Restaurant brings a certain French sensibility to their cuisine, offering up a refined experience in a romantic setting. According to their website, the staff of La Ferme “offer fine French cuisine in an elegant country-farmhouse décor, complete with a large fireplace, outdoor seasonal covered porch seating, live piano music and ample free parking.” Brunch is served on Sundays from 11:30 a.m.-2 p.m., and includes their delicious Omelet Landaise, served with sweet pepper, onion, tomato, basil pesto, and fresh goat cheese. If you’re in the mood for a more refined brunch experience, La Ferme is calling. Stanford Grill has two locations in Maryland, one in Rockville and another in Columbia. Stanford Grill has a warm, open environment with lots of natural light. While most of their business is lunch and dinner, their Sunday brunch is not to be overlooked. For a lighter option, try their Farmer’s Market Egg White Omelet, made with market vegetables and tomato salsa.